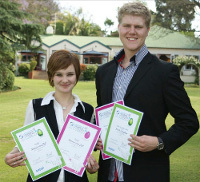 Two Graphic Design students at CUT were chosen as finalists in the Institute of Packaging South Africa (IPSA) Gold Pack competition which was recently held at Inanda Sandton in Gauteng. This year IPSA received hundreds of entries from entrants, whom were invited to the annual Awards Luncheon where these remarkable packaging entries were presented. IPSA creates the opportunity for students to enter in their annual Student Gold Pack competition and showcase their innovation as well as creativity in three categories namely; Graphic Design, Packaging Technology and Food Science Technology. In the Graphic Design Category, Erick Strydom, CUT Graphic Design student was the winner with the design his design for “Iconic Beverage Packaging”. His outstanding packaging concept showcased four Steri-Stumpie (flavoured milk soft drink) containers grouped together by a packaging mechanism to represent the udder of a cow. The judges recognised the on-pack communication and humorous implementation of the bar code (which was in the shape of a cow), as well as his innovative and clever use of shapes and forms. “As an introduction to the industry, it was an eye opener to the exciting world of packaging technology. Not only can I apply the principles and methods to product development, which I aim to do someday, but the extensive research applies to most fields in design,” said Strydom. In the Packaging Technology category, the brief was to propose the suitable packaging for a home security kit. The Packaging concept that Strydom created was the runner-up in this category. The judges were impressed with the professional and original nature in which he executed the project. Nineve van Zyl received finalist-status in the Design Category for the project brief: “Tissue packaging with powerful brand communication”. Her unique method of combining text, graphics and functional aspects surpassed expectation. In the Packaging Technology category, the brief was to propose a packaging concept that would encourage the use of sunscreen in South Africa. Nineve’s innovative and consumer-friendly packaging concept amazed the judges. The sunscreen pack is in the form of a tube, with a silicon rubber application head that contains soft rubber bristles for hands-free application together with a re-fill option that is friendly to the environment. “It is always great to have this kind of achievement to add to your resume, I also enjoyed the networking opportunity and to meet industry insiders as well as fellow students from around the country,” remarked Van Zyl. This achievement has laid the foundation for a career in the Industry of packaging or Packaging technology as an occupation, two growing and exciting fields in South Africa. As a University of Technology, CUT ensures that instructional programmes has complimentary characteristics that distinguish the programme from traditional university programmes – the high calibre of students delivered is shown through these tremendous achievements! Pictured is Nineve van Zyl and Erick Strydom.